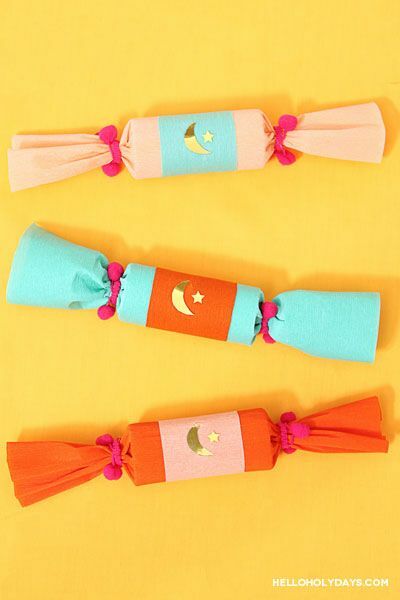 DIY Ramadan Party Crackers – Hello Holy Days! In North America, British Christmas crackers grace holiday tables year round, not just December. From Valentine’s Day, to Halloween to Hannukah, every holiday has its own version of these crackers. Here’s how to make a Ramadan version of these popular party crackers. 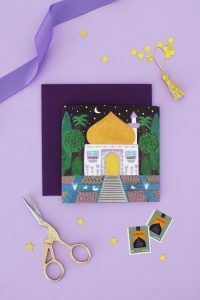 Use brightly coloured crepe paper, embellish with the symbol of Islam (in gold no less!) and tie with fun pom pom ribbon. Fill with candies, grab a partner, and enjoy tearing the crackers with a pop! Cut a 12″ wide by 10″ long piece of crepe paper. Center a cardboard tube at the edge of the crepe paper. Insert cracker snap and roll crepe paper around the tube. Secure with tape. Tie one end with a golden twist tie. Fill candies through the other end. Close with another golden twist tie. Cut a 2″ wide by 7″ long piece of crepe paper in a contrasting colour. Roll around the center of the tube and secure with tape. Cut out a crescent moon from the piece of gold plastic paper. Hot glue onto the tube along with one gold star from a gold star confetti pack. 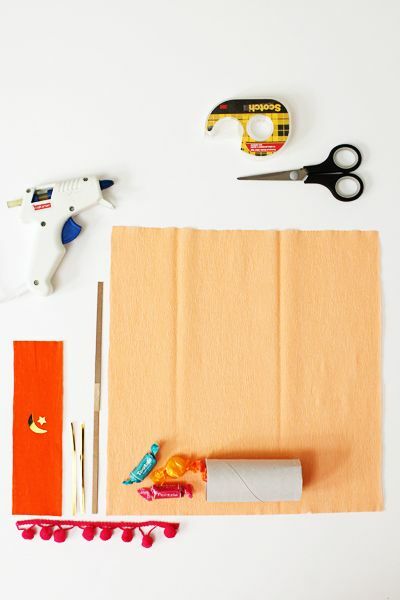 Finish crackers off by tying pom pom ribbon on ends. Tip: When tearing cracker, make sure partners hold the ends such that the cracker snap is also firmly grasped underneath the crepe paper. Otherwise, you won’t hear the pop.